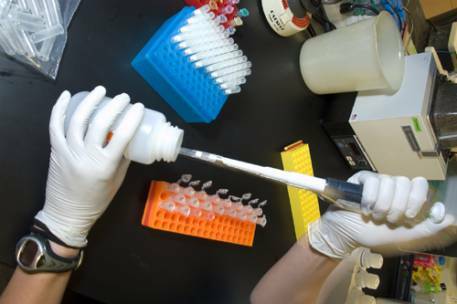 UW Medicine Pathology has a strong focus on basic science and clinical research. Our research principle, followed since the establishment of the University of Washington School of Medicine, is that research based on the most modern methods and the up to date knowledge of basic sciences is an essential component of an academic department of pathology. This is particularly true at the present time when new discoveries generated by basic biomedical research are applied to pathology practice. The research done by our faculty has received high recognition both nationally and internationally. The Alpers Laboratory of Renal Pathology has research interests which include experimental renal disease, diagnostic human renal pathology, developmental renal biology, and solid organ transplant rejection. The focus of the Byers Research Laboratory is to identify and characterize the molecular bases and disease mechanisms responsible for heritable disorders of bone, blood vessels, and skin. The major genetic disorders studied in the lab include all forms of osteogenesis imperfecta (OI) and Ehlers-Danlos syndrome (EDS); Loeys-Dietz syndrome, familial aneurysm syndromes and other similar disorders. The Byers Research Lab is housed alongside the Collagen Diagnostic Laboratory, a certified clinical laboratory that provides testing and consultation for patients and their families with suspected connective tissue disorders and the associated clinicians. The broad interest of the Cimino research lab is to better understand the biologic behavior of brain tumors through a combination of human molecular genetics and experimental studies employing small animal models. The overall goal of this work is aimed to potentially improve the management of brain tumor patients through refined brain tumor classification and risk-stratification. The Darvas Research Laboratory focuses on brain circuits as well as structural and molecular bases of learning and memory, the study of mouse brains in aging and Alzheimer’s disease models, investigation of pharmacological therapeutics aimed at preventing or reversing dementia and pathologic processes associated with progressive Alzheimer’s disease, and development of state-of-the-art quantitative neuropathology assays for Alzheimer’s disease pathologic changes in frozen and formalin-fixed autopsy tissue. The Davis Lab is focused on uncovering the mechanistic basis for how the heart heals, repairs, and remodels in response to injury and disease. We are tackling the fundamental problem in which contractile muscle is replaced by fibrotic scarring by resolving the cellular and molecular basis for fibrotic scar formation. In addition, we have demonstrated that intracellular and extracellular biomechanical signals are central determinants of maladaptive cardiac remodeling. In lieu of this result, our lab seeks to understand how cell and tissue forces are sensed and transduced into changes in cell geometry, differentiation, and proliferation. The goal of the Disteche Lab is to understand the mechanisms of dosage compensation by X up-regulation of the single active X chromosome of males and females in terms of molecular processes. Research in the Kaeberlein Lab is focused on developing therapies for age-associated diseases by targeting the pathways that regulate aging. The Keene Lab focuses on Alzheimer's disease, Parkinson's disease and toxicity. Over the last 15 years, the HPV research group has conducted a variety of studies focused on HPV and HPV related cancers. The Loeb's Lab research is centered on the molecular biology of mutagenesis, and our goal is to understand the relationships between DNA damage, mutations and cancer. Our current work involves the study of the fidelity of DNA replication, an analysis of mutator phenotypes in human cancers, the creation of new enzymes for cancer gene therapy, the relationship of mutations to aging, and the prevention of HIV replication by mutagenic nucleoside analogs. The Monnat Lab is located in the UW Departments of Pathology and Genome Sciences in Seattle. Our research is focused on the mechanisms that ensure human genomic stability and determine cancer therapeutic response. We also develop and apply genome engineering tools to advance biology and disease treatment or prevention. Since 1996, the Murry Lab has worked to understand the mechanisms that underlie cardiovascular disease and to develop new treatments. We have a longstanding interest in the biology of myocardial infarction (heart attacks), and in particular, how the heart heals after infarction. The lab has a major focus in stem cell biology and tissue engineering, where we seek to understand the molecular basis for cardiovascular differentiation, and to harness the potential of stem cells to repair the heart. Recently, our group has begun to use stem cell approaches to study genetically based cardiomyopathies. Najafian Lab research strives to better understand pathobiology of kidney diseases. The Oshima Laboratory is interested in the genetic mechanisms of aging and age-related disorders with a special emphasis on the progeroid syndromes. In the past 15 years, our main focus has been the genetics and pathogenesis of Werner syndrome. The Promislow Lab works on the evolutionary genetics of life history strategies and sexual selection, bringing a systems biology perspective to the study of natural genetic variation for traits relevant to fitness and disease. We use empirical, epidemiological, bioinformatic and theoretical approaches in studies on a variety of organisms, from flies and mice to dogs, marmosets and humans. The primary focus of the Rabinovitch Laboratory's research is on the use of genetically altered mouse models to examine the effects of cell signaling and reactive oxygen species (ROS) on lifespan and healthspan. Transgenic mice that overexpress catalase have been found to be protected against multiple health challenges, including cardiac aging, sarcopenia and some cancers. A second area of lab interest is studies of neoplastic progression. These focus on precancerous human gastrointestinal diseases and the hope that a better understanding of these disease processes will yield improved management of individual patients and their cancer risk. The Rea Lab is working to define the fundamental molecular causes of aging and makes use of several model organisms ranging from worms to mice. Areas of special emphasis include mitochondrial dysfunction and retrograde signaling, human cellular senescence and life extending interventions. The Risques lab is broadly interested in the molecular alterations that underlie the transformation of an apparently normal human epithelial cell into a tumor and in the translation of these alterations into potential tests to detect and predict cancer. We are especially interested in two alterations that link cancer and aging: telomere shortening and mitochondrial dysfunction. The Young lab is interested in determining the molecular and cellular mechanisms behind genetic risk for late-onset sporadic Alzheimer’s disease (SAD), the most common neurodegenerative disorder. The Zhang Lab's research focuses on understanding the molecular mechanisms of Parkinson's disease development and progression, and exploring unique biomarkers for diagnosing Parkinson's disease and monitoring its progression.